Republicans talk up efforts, to end the backlog at the state crime lab. 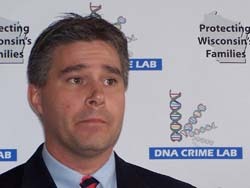 Flanked by Assembly Speaker Mike Huebsch and other GOP lawmakers, Attorney General J.B. Van Hollen insists his Justice Department will be able to eliminate by 2010 the backlog of DNA evidence, thanks to 31 new analyst positions. Fifteen of the new positions will be filled as soon as the bill is signed by Governor Doyle, the remaining 16 in July. Van Hollen concedes that even the new positions won&apos;t completely solve the problem; the crime lab will have to increase productivity and efficiency, as well as work with law enforcement agencies to determine what evidence should be submitted for testing, and what shouldn&apos;t. Leaders in both houses of the legislature have agreed to the positions, contained in the budget repair bill.